For the third time in half a year, the statue commemorating the Jewish community in Thessaloniki is vandalized. A monument in the Greek city of Thessaloniki that commemorates the Jewish community was vandalized on Friday for the third time in the last six months. Parts of the monument located on the campus of Thessaloniki’s Aristotle University were found smashed and broken into several different pieces. 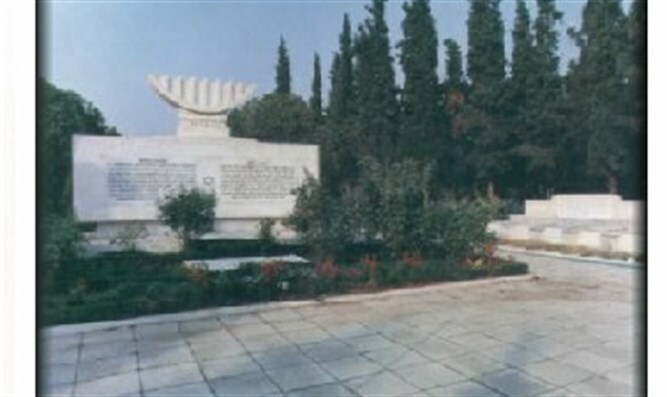 The monument, a series of gravestones in a bed of grass next to a broken menorah, commemorates the city’s historic Jewish cemetery, on which the university is built, and is dedicated in memory of the Jewish students who were killed in Nazi death camps. The monument was unveiled in 2014The Greek police opened an investigation into the incident. Aristotle University condemned the event, which it described as "a shocking racist hate crime" and called on the assailant to cease his campaign of destruction. "This is an even more serious anti-Semitic incident because of the proximity to the International Holocaust Day," said MK Ayelet Nahmias-Verbin, who chairs the Israel-Greece Friendship Lobby. "I am in constant contact with the Greek authorities in the hope that the perpetrators will be promptly identified and prosecuted. Unfortunately, anti-Semitism is exacerbated by the internal tensions in Greece." The monument has been defaced multiple times, with the most recent incident occurring in July when a large cross was painted on it. The Jewish community of Thessaloniki was a vital center of Sephardic Jewry for 450 years following the expulsion from Spain. Known as the “Flower of the Balkans,” it was the center of Ladino culture in the region. During the Nazi occupation, the Germans destroyed the cemetery, using the grave markers for construction material.